The Master of Architecture (MArch) programme is the second part of a two-degree sequence in professional architectural education. It is a taught postgraduate programme for students who intend to become architects. Applicants who possess a pre-professional degree in architecture, or its equivalent, and relevant work experience are eligible for admission. Application for admission to the MArch programme for academic year 2019-20 should be submitted via the Graduate School Online Application System no later than 18 January 2019. 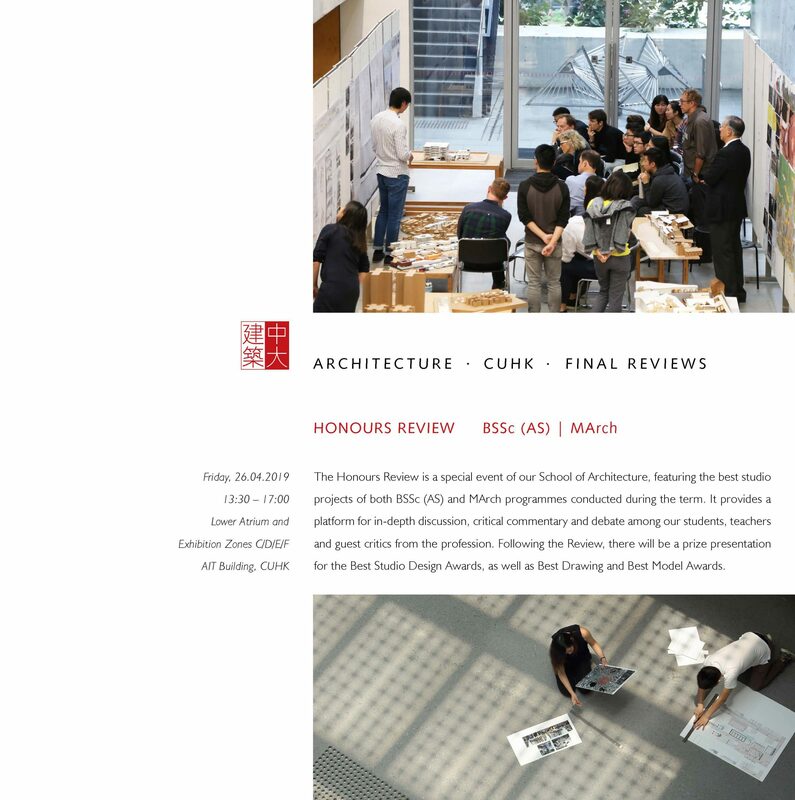 In addition to fulfilling the Entry Requirements of the University, applicants should have completed a pre-professional architecture degree, such as BSSc (Architectural Studies) from CUHK, RIBA-validated Part I degree, or equivalent. Applicants should have also undertaken a minimum of nine months’ practical work experience after completion of their respective undergraduate degree. The requirement for practical training can be waived for applicants who possess a five-year undergraduate professional degree in architecture. Applicants should upload their supporting materials to our Application Materials Collection Platform no later than 18 January 2019. Candidates will be invited for an interview on 16 February 2019, details will be announced in due course. For more information on application procedures and other supporting documents required by the University, please visit the Graduate School website. Provisional tuition fees for UGC-funded students and self-financed students in the academic year 2019-20 are HK$42,100 and HK$160,000 per annum, respectively.